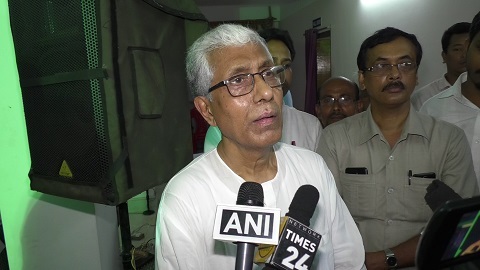 Former Chief Minister of Tripura Manik Sarkar, and present Opposition Leader has appealed to the people of the State to avoid rumors, maintain peace and help the government. He was referring to the recent deaths in lynching following rumors of child lifters gang moving throughout Tripura. Without naming the State Chief Minister Biplab Kumar Deb and Law Minister Ratan Lal Nath, Sarkar was critical about the initial comments made by these leaders regarding a ‘kidney racket’ in the State. However, he felt that the police, administration, and government have taken some positive steps towards stopping the rumor mongers and appealed to the people of the State to come forward and help the government in maintaining law and order. “No one should take law in their hands, if they doubt anyone then should bring it to the notice of the police. To maintain the peace and harmony of the State, people should together come forward and help the government because without this it will be tough for the government. This is my appeal and to the government, I shall request to stand by those families who lost their lives and also bear the cost of the treatment of the police personnel in the hospital,” said Sarkar, also a CPI-M politburo member. Sarkar also informed that on the conclusion of the Assembly session he had a short discussion with Chief Minister Deb about the Mohanpur incident and requested him to see that peace is maintained in the State. Meantime, along with Sarkar was the All India General Secretary of the SFI Vikram Singh who criticized the newly formed BJP-led government in the State for the deteriorating law and order in the State.